The Gentleman Crafter: A Day At The Paper Crafter's Library! Hello Everybody and Good Morning! 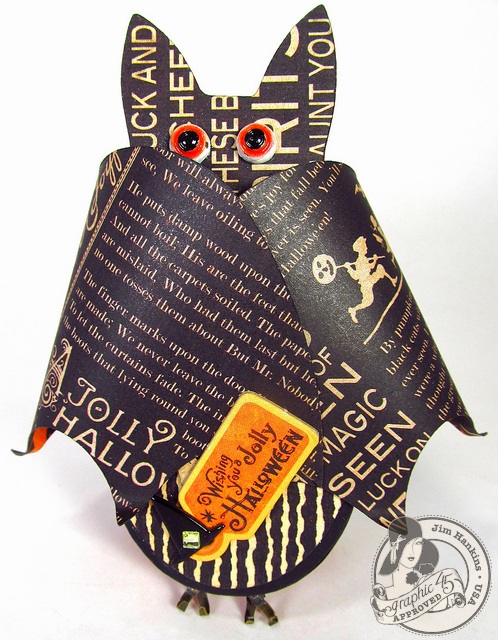 Please join me over at the Paper Crafter's Library today for a tutorial on how I made a really fun, fast and easy Halloween project using the fantastic Happy Haunting Collection from Graphic 45! This project will be GREAT for your all your special Trick or Treaters! Mr. Battie is adorable, Jim! What a great way to gift some treats to those special trick-or-treaters in my life! Great project, as always! Now, that is just stinking cute. Going to have to go to the "library". So super cute! Congrats on being featured on the paper crafters library! What a cute clever idea! Thank you for sharing! You have been busy, so cute!!! ok...i gotta know...do you live on monster, starbucks and 5 hour energy????? How do you get so much done??!! Love the bat!! he is sooooo cute! This is so stinking cute! Never thought I would say a bat is cute! I will check out that library when I am home! Thanks for the link. Can't get over how clever and cute this is...all the way down to those little feet!! This project just makes me smile!! It's wonderful! I'm not a Halloween kind of person, but gosh this is adorable. What a great way to give the kids candy on Halloween. You did it again JIM, great job! Oooh it looks great - I have just ordered a couple of sets of Graphic 45 Halloween stamps - cant wait to have a play! I have also been playing with configuration boxes again - projects here if you fancy a look: http://www.sunshinegirlnicola.blogspot.co.uk/2012/09/a-grave-tale.html would love to know what you think! Ooooh that's such a cute little bat. I'm definately going to try to find a small oval box to make one as I already have the G45 Halloween papers. Thanks for the really clear tutorial Jim. P.S. You should rest tonight! That is the cutest thing! I thought it was a paper candy "bag" for guests. When I saw it was a full sized treat box, I was bowled overn. The artistic Hampster is looking for an oval box! What a totally wonderful project!! I ran out this afternoon and picked up some of the boxes so tomorrow I can get down to business. I think on one of them I'll put a little hair bow so I can have a girly bat. I just love all your projects..I told my favorite clerk at Archivers about you and today the minute I walked in she came up to me and asked if I had seen the super Halloween hat you had made and of course, the cute bat. As they say in my neck of the woods " You go boy " ! !Simply "bat-tabulous ... you winged it " ( I know silly huh? ... )! I subscribe to that site and was excited to see someone I know.....Fantastic job!!! your full of surprises...so I shouldn't give up on the ustream just yet....should I! How cute is this?????? Love it. Great idea that I plan to use as we are taking the twins (grand-kids), to Disneyland for Halloween this year. These would definitely be so cute to surprise them with. I never thought I would call a bat cute either, as we have problems with real bats nesting under our home. Hate them - dirty and very messy to say the least, but these are adorable. TFS with us. You are definitely on a roll here Sir Jim. Great stuff rolling out of your craft room. Luv it. Now you have given me an idea--I have a coffin-shaped papier mache box that will make a really cool Dracula--cape instead of Bat wings, Dracula head instead of bat head! And I'll need to figure out a way to do some feet that wont interfere with opening the box! Hmmmmm--the front half on the box lid, and the back part on the bottom? Or something like that! Your bat it so clever! Love those spooky eyes! Love your cute little bat; couldn't wait to check out the tutorial to see what was "inside"! !